Click on the number under Waiting For Approval on your Inventory home page. On the Process New Request screen, you will see the first Inventory request that is waiting for your approval. If you would like to process a different request, you can select it from the Unprocessed New Requests drop down list. On the Process New Request screen, you will see the first Inventory request that is waiting for your approval. If you would like to process a different request, you can select it from the Process New Requests drop down list. Check Yes next to Issue Inventory Now? This will automatically change the status of the request to Approved. If you do not have enough on-hand inventory to fulfill a request you can create a back order for it. You can put the entire inventory request on back order. You can also partially fulfill the request by issuing some of the inventory now and putting the rest of the requested items on back order. If you need to put the entire request on Back Order, select Back Order from the Status drop down field and then click Submit. *Note: Pool is not required when creating a Back Order. 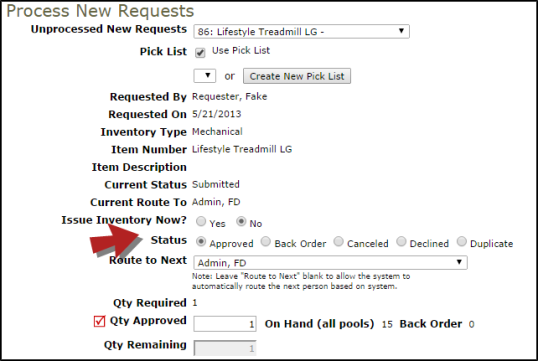 If you would like to partially issue the request, select Yes in the Issue Inventory Now? field. This will change the status to Approved. Check the box next to Create a back order request for the remaining quantity not issued? to create a back order for the remaining quantity.